Today my son will be taking a school trip to see “A Charlie Brown Christmas”, the live adaptation of the famous Peanuts holiday special, performed by The Children’s Theatre of Cincinnati. As I sit here, I cannot help but think of the famed scene where Linus explains to an overly commercialized crowd the “true” meaning of Christmas. Christmas is, after all, a religious holiday stemming from Christianity’s greatest gift. It is that gifting concept, the concept of giving more than receiving, that is so important to remember. I try often to teach my children the importance of giving, especially at Christmas, the time of giving. Mostly, we here in Fort Thomas are so fortunate it can be easy to take the gifts we receive for granted. However, we may forget that in the world, in the nation, and even in our city, there are many who have far less and so as a community, a small act from a few caring citizens can go a long way to making another family’s Christmas into a day to remember. In response to the needs within our community, the Fort Thomas MOMS Club has stepped up in a big way to ensure that seven families in our city can experience firsthand the magic of Christmas. The MOMS Club is the international organization of support for groups of mothers who have chosen to stay at home and raise their children. Mothers of all ages with children of all ages are members of the club and it is an opportunity to ensure women can have support, adult-interaction, and can create the “village” that is so necessary to raising decent children. 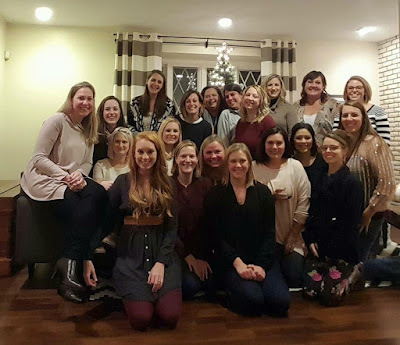 I have been a member of the Fort Thomas MOMS Club for a few years now, having served on the Board twice and once as immediate past president so I am proud of the organization. I’ve been involved in a number of great initiatives. But this holiday season, the club has stepped it up and is “adopting” seven families (identified by the Fort Thomas Independent School System) in Fort Thomas to ensure their holidays are bright! Elizabeth Delp, member, said "I grew up getting to help pick out items for a needy child every Christmas and it was always a wonderful experience. Imagining the child loving what we picked out was very rewarding. I want my children to know that not everyone has the extra money for Christmas and some families need help. This year we took 2 girls from the Brighton Center and a 14 month old boy from Fort Thomas. We picked clothes, books and their special "wish item". I think my 5 year old really got the message this year and was excited to help." This year’s sponsorship included seven families, providing them with gently used clothing and baby items such as strollers, gifts for these families for Christmas. Additionally, the organization took four cards from the giving tree at the YMCA and will be providing needed gift cards for these families to buy clothing to fit their needs as well as wish list items. So, as you wrap up your holiday shopping and finish wrapping your gifts, please think if there is any other way you can help. I’ve seen some incredible ideas floating around including using your Elf on the Shelf to encourage your children to donate one gently used toy per day and explaining the concept of donations to them. This serves two purposes, instilling this philanthropic value in your children AND clearing up space for the Christmas gifts from Santa. There are still items needed at the YMCA Giving Tree and through other local organizations such as the Brighton Center or becoming a shoe buddy for the Charities Guild of Northern Kentucky. Remember, if it is better to give than receive, then make sure to do more of the former than the latter. Share your best family giving traditions in the comments below!